This document enables you to serve a statutory demand SD2 Rule 10.1 against an individual to recover a specific debt that you can prove is owed to you. If the debt is not repaid, you can follow with bankruptcy proceedings. We include guidance as to how to complete the documents and how to serve the notices. You do not need to involve your solicitor or a debt collection agency. A statutory demand can be an incredibly powerful debt collecting device. The law assumes it merely paves the way for a bankruptcy petition, but the threat alone can spur repayment from the most obstinate debtor. Used under the right circumstances, you shouldn’t need to go any further than issuing the initial paperwork. Furthermore, the procedure to issue a demand is very easy to follow. Using one of these forms, the guidance and the letter in this pack you should be able to issue a demand yourself without needing to involve solicitors or pay court fees. 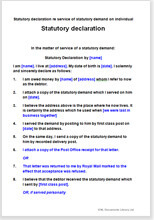 You can use this form and guidance to serve a notice on any individual. If you are trying to recover debts from a business partnership (but not a limited liability partnership or LLP), you can serve the notice on any partner as if you were recovering the debt from an individual. It is usual to pick the most senior partner, but you can pick any. Just make sure you pick a person who does have the wealth to repay you. If you are trying to recover debts from a company or a limited liability partnership, then these forms are more suitable. We provide you with two versions of form SD2 10.1 under section 268(1)(a) of the Insolvency Act 1986. Rule 10.1 of the Insolvency (England and Wales) Rules 2016 provides list of matters that the demand must contain. Some of the text in the forms is laid down in the Insolvency (England and Wales) Rules 2016, a, and therefore must be left precisely as it is. We have made clear what that is. The format and layout are not laid down, so we are able to provide our own user friendly version of the form. Demands are not served as often as they could be. A common misconception is that a solicitor is needed to prepare the forms, or that it is a difficult process or that serving one is a certain path to litigation. In fact, in the right circumstances it is a fast and efficient way of collecting a debt that can be undertaken by anyone. But if your debtor is to believe you will bankrupt him, you have to make him see that it will be worth your while. The bankruptcy petition minimum amount is £5,000 for an individual. Therefore, if you use statutory demand on debts less £5,000 on a debtor who knows the rules knows that if they fail to pay a statutory demand it does not matter as you cannot follow through with a bankruptcy petition. So we suggest that the minimum amount that you should pursue is £5,000. You should reckon that your debtor is likely to repay you rather than risk his reputation. This is true of most people who borrow for personal use (such as a mortgage) but it is also true of people who run a business that relies on credit. There is full example text completed in our version to guide you with the wording you might use.